Baby gates are used by parents to keep their children safe from falling down stairways, getting into the kitchen while a meal is cooking and getting outside alone. There are many potential uses that a parent could use a baby gate for so it is important that it is constructed well and have the features needed that make it a useful piece of baby equipment. There are many different types of baby gates on the market to choose from. The number of choices available can make deciding on one a real challenge. The top rated baby gates featured in this review are customer favorites due to their quality of construction, durability and performance. Read about the details and features these top rated baby gates offer and decide which one you like. These top rated baby gates have great looks, sturdy construction and many features that make them a great choice for your baby gate needs. When there are many different choices available for a product you want, it is a good idea to do some research and learn about the different options out there. It is also important to learn how to tell the difference between a product that is good and one that needs to be passed by. Using this Multi-use Bronze Deco Extra tall baby gate will protect your baby or toddler with style. The beautiful bronze metal can be adjusted to accommodate different sized doorways and stairs. All of the hardware is included for mounting securely or you can pressure mount if you choose. Pressure mounting should not be used for stairways. Measurements of the baby gate are 36” high and will fit doorways from 38” all the way to 48”. The gate features convenient one handed operation that makes carrying the baby and still walking through the gate simple and efficient. It also has auto-closure so when you go through, it automatically closes behind you. The gate can open in either direction and if being used at the top of a staircase, it has a door stop that allows for even more security and safety for your children. Have added security with the automatic lock so older toddlers can’t open the gate on their own. This gate is perfect for little ones ages 6 months to 24 months of age or a little older. You will need tools to mount this gate if you use the wall mount, which should always be used at the top of stairways of any kind) but installation is not complicated. If you’re looking for a mega baby gate, this 4-in-1 Metal Gate/Play yard is just what you’re looking for. When this gate is extended, it can expand to accommodate 192” gap making it perfect for today’s open floor plans. When enclosed, it can contain an area that is 19 square feet. It can be configured in a variety of shapes and sizes to fit whatever needs you may have. You can use the Regalo Super Wide Gate and Play Yard as a fireplace guard, wide opening baby gate, play yard and stairway barrier. 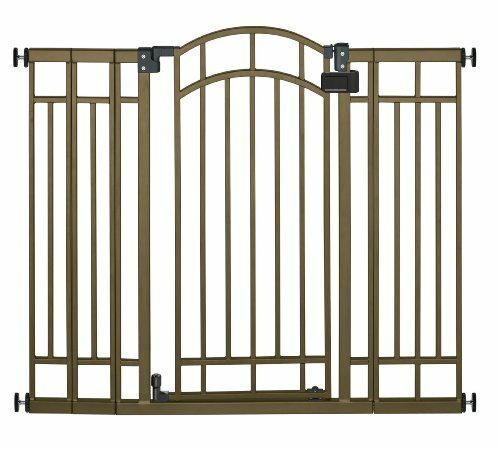 It includes all the hardware needed to mount the gate to the wall for a secure and long lasting safety gate that can’t be knocked down. There is a 2.5” space between each bar, not wide enough to get heads or legs through. The non-toxic powder coating is super safe and scratch resistant. It has 8 removable panels that can be reconfigured in many different ways or attached end to end for blocking large spaces. The walkthrough design is very convenient to use and has a safety locking feature so the little ones don’t open the gate and follow you through. This metal baby gate is Juvenile Product Association Certified. Great for babies and pets too and comes with a 90 day warranty from the manufacturer. 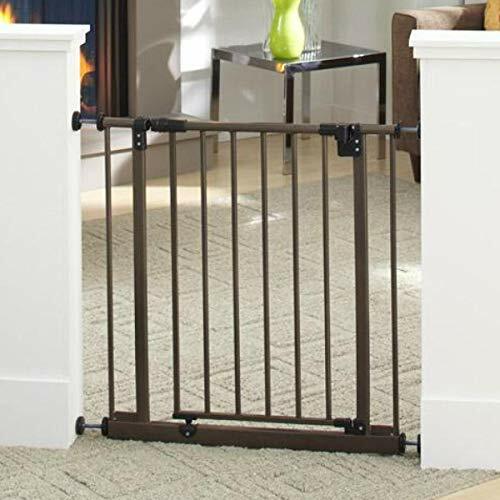 Keep your children and pets safe all the time with the North States Supergate, Easy-Close Metal Gate. This gate conveniently swings open in either direction and offers a secure, triple locking system that can be operated with only one hand. Perfect for when your arms are full or you are carrying the baby. The North States Supergate measures 29” high and fits doorways that measure 28” to 31.5” wide. With the included extensions, you can use it in doorways up to 38.5” wide. This pressure mounted baby gate installs easily and no hardware is required to set it up. It has a hold open feature that makes walking through with your arms full super easy. The North States metal baby gate should not be used for stairways because it is pressure mounted. Pressure mounted only gates are for use in doorways and not the top of stairways since the gates can accidentally be knocked over if enough force is used. They can be used for the bottom of stairways though. The bronze powder coated metal construction is strong and durable as well as attractive. Set up is easy… just place the gate in the doorway of your choice and adjust the tension mounts on either end until it fits snugly and securely against the wall. Shutting the gate is easy, when you are through just give it an easy push and it will swing shut and lock. It’s perfect for ages 6 months to two or three years of age. Make sure that when installing this metal baby gate, the bottom of the frame is completely flat against the floor. Baby gates are used every single day by parents that want to ensure the safety of their babies and pets. There are many different models of baby gates on the market so choosing the right one could cause a lot of confusion if you don’t know what you’re looking for. The top rated baby gates featured here will work for a variety of doorway sizes and will work to keep your baby in a safe space. Continue reading below to learn detailed information about baby gates and what you need to look for when it comes to choosing the right one for your needs. With the right information you will have an easy time sorting through the choices and finding exactly what you are looking for. Before a baby is able to move around on their own, such as crawling or walking, the necessity for blocking doorways isn’t really important. Once they reach the age of crawling and scooting and even rolling around, having a baby gate is a way to ensure that your baby stays safe. A baby gate is a hard plastic or metal gate that fits inside the doorways of your home. They can also mount directly to the walls to block stairways and other large openings and can even be used as a fireplace barrier in some cases. There are a few things that you will want to consider before you start searching for a baby gate to fit your needs. Keeping your baby safe is a top priority so you want to make certain that you take all things into consideration before you start shopping. Where will you be putting the baby gate or gates? – Baby gates are most often used in internal doorways inside your home, such as the doorway from the living room to the kitchen, etc) entry ways, the bottom of stairs and the top of stairs. Sometimes they are used in extra wide openings or odd spaces as well. How will you be mounting the gate? – There are two ways to install a baby gate: pressure mounted and hardware mounted. Pressure mounted baby gates require no hardware and are good for situations where you need to move the gate around from room to room. If you don’t need to move the gate or if you want to install one at the top of a stairway, you will want to use the hardware mounted baby gates which are much more secure. Never use pressure mounted baby gates at the top of any stairways. Are the gates going in high or low traffic areas? – If you are blocking a doorway that you will need to go through often, look for the baby gates, like our top rated models, that have swinging doors, also known as a pass through design. This makes going in and out of the room much easier and safer since you will not need to scale the gate or take it down to get through. For any doorways that you do not need to go in and out of very often, a more permanent solution will probably be just fine. What type of construction do you want? – It used to be that most baby gates were constructed from either wood or hard plastic. Sometimes they were constructed from metal. Nowadays, many more gates are made from metal and for good reason. Metal is much more durable and long lasting than either plastic or wood. They come in a variety of colors and give the home a more polished look when they are installed permanently. What design are you looking for? – Many of the currently available baby gates have some style to them in the form of arched tops, fashion colors and more. Once you decide what type of gate you want, there will more than likely be some flexibility in colors. There are two kinds of baby gates available in terms of mounting: Pressure mounted or tension mounted as it is also known, and hardware mounted. We have explained each type in detail below. These are very common baby gates and are installed easily with no tools required. They are popular due to the ease of installation and the fact that they can be moved around from doorway to doorway and easily traveled with as well. This type of baby gate works the same way tension shower rods work. They are held in place by the pressure of each end pressing into the wall. To ensure the continued safety of your baby, be sure to follow the installation instructions in order and to the letter and never use them for the top of stairways. Pressure mounted baby gates are usually cheaper than the hardware mounted varieties and have some advantages that make them popular choices among consumers such as not having to screw them into the wall or banister, and they have a larger variety when it comes to style choices. There are some disadvantages to using the pressure mounted baby gates. These include things like not being able to use them for dividing areas with a height difference, will not hold up if a dog charges it, can slip and fall under the weight of the children if they lean on it or try to climb it. They can leave rubber marks on the way and if you use them when the rubber stoppers are worn, they can actually cut into the walls. If you want to avoid the rubber marks that can be left on the walls from using a pressure mounted gate, use a pressure gate wall saver. When used from the beginning when the gate is first up, you will not have any damage to the walls and won’t even need to repaint. Hardware mounted baby gates screw right into the walls and attach via specific hardware that is designed for that purpose. 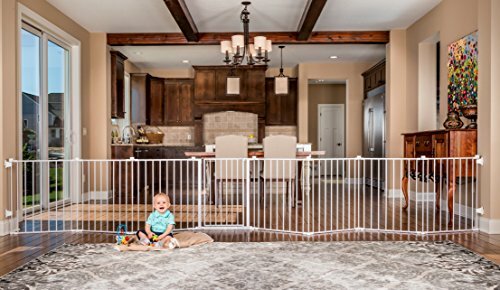 The drawback to hardware mounted gates is that they will leave small holes in whatever you attach them to, but they are strong, secure and sturdy and can withstand dogs running into them and are truly the most secure type of baby gate available anywhere. They can be mounted directly into walls, doorframes, and banisters. These are the type of baby gates that you should install in places where a baby gate falling can result in very serious injury. These would include around the fireplace or woodstove, at the top of a deck or porch, at the top of any staircase. Some of the advantages to hardware mounted gates include that they can handle the weight of a toddler if they should try to climb the gate. They are also resistant to falling down around animals that may jump up on them as well. You can mount them to the walls or doorframes even if thresholds or baseboards are present. There are several features that you want to look for when it comes to choosing a baby gate. These things are all features that different models of baby gates may or may not come with. Whichever features are important to you should be the ones you look for in the descriptions of the baby gates you are interested in. Opens easily for high traffic areas – The hardware mounted baby gates typically hate gates that will swing open and shut so you can pass through easily. Climbing over the gate with things in your hand or while carrying the baby is not safe. Even if you are careful, you can accidentally trip. No more than 2 – 3/8” space between slats – The Juvenile Products Manufacturer’s Association (JPMA) makes sure that no more than 2 3/8” between slats so an child’s head cannot get through and cause strangulation. The narrower slats are much safer. Safety Standards – Make sure that the only baby gates you consider are the ones that have American Society for Testing and Materials/JPMA certification. This means they have met the necessary safety standards to ensure the maximum safety for your child. Fit Range – Most baby gates will block a standard sized doorway. If you are looking to protect a larger area of have wider than normal doors you will want to find gates that have the ability to block them whether with an organic range already or with the use of extensions. One hand operation – When you have your arms full of laundry or you are just holding a child, you don’t want to have to juggle them to try and get the gate open. Many of the metal gates that have swing out gate sections are one hand operative. This means they can be opened and shut with one hand easily with no struggle. Dual – Direction Swinging Door – A real convenient feature is the dual seining gate which means the gate can open either towards you or away from you. Expandable Gates – These are great for when you have many different doorways in different sizes. Extension kits are available for most gate types to make them work for any doorway. These expandable gates are perfect for homes with larger than normal doorways that may require extra wide gates. Baby gates will always be sa popular piece of baby equipment due to the necessity of blocking certain unsafe areas off from your baby. Babies can really get around and since they have no idea they are getting themselves in danger, it is even more important that there are reliable safeguards in place to prevent terrible accidents from occurring. These top rated baby gates featured in this article and information given will help you sort through the large array of baby gates that are made in different styles and sizes and come up with the perfect solution for your specific needs. When you are armed with the proper knowledge you won’t purchase items that will not meet your needs. The purpose of these reviews and the buyer’s guide is to prevent those disappointing purchases from being made. You will make a decision that youn will be confident in and get plenty of use out of, while protecting your baby too.